This week’s Cool Actor is a little something different. We’ve mostly been featuring tough guys but in a lot of those tough guy action movies there was always a role for the cute, funny, ditzy combination comedy relief/sort-of love interest who didn’t get too serious with the hero because that would slow down the action. The great Joe Bob Briggs called this the “Rae Dawn Chong role”, after the actress who took these nothing roles and made them her own. Yes, I’m talking about Tommy Chong’s daughter, Rae Dawn Chong. Another big role for Rae was 1986’s widely panned Soul Man. If it’s remembered at all these days it’s for the cardinal sin of C. Thomas Howell in blackface but the point of the movie wasn’t to make a minstrel show, it was to examine the whole idea of Affirmative Action and racial quotas in higher education. Of course this was the 80’s and they tried to be a comedy with a message and never really carried it off. The reason I even mention it is Rae Dawn Chong ended up marrying C. Thomas Howell, making them the ultimate 80’s cheese power couple. 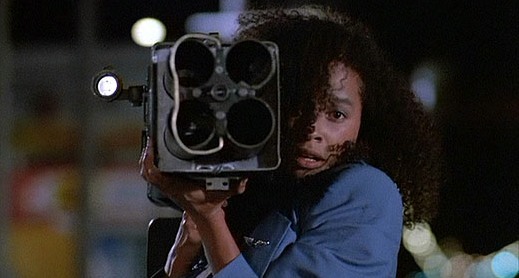 Rae Dawn Chong continued through the late 80’s and early 90’s in a string of just-short of A list movies, gradually dropping down to B movies and made for TV thrillers. She’s still working today and has a role in the upcoming Jason Segel comedy Jeff Who Lives at Home from the rising writing and directing team of Mark and Jay Duplass. It sounds like Rae Dawn Chong is bringing the Rae Dawn Chong role back to the almost-A List movies in the new millennium.